Lack of respiratory muscle strength is the primary reason your respiratory system is unable to meet your body's needs during physical exertion. Additionally, some medical conditions exacerbate respiratory muscle weakness, causing sleep disturbances and dyspnea. However, the respiratory trainer market does have several options, and it may be difficult to distinguish the differences between various products available. 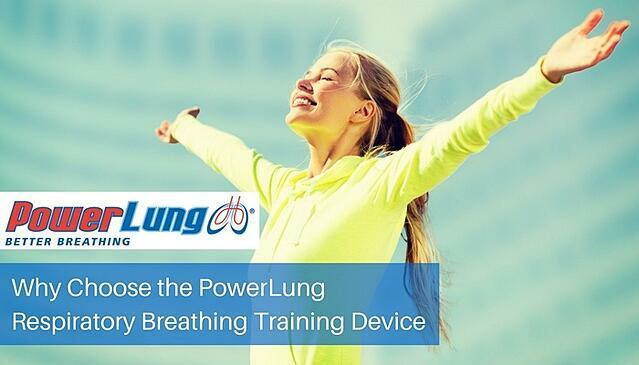 When choosing a respiratory muscle training device, look to PowerLung, a device designed to train all muscles involved in breathing, easy to use and with a host of additional benefits. All models of the PowerLung offer separate dials for both inspiratory and exhalatory capabilities, allowing for customized training. Additionally, each of the models (except the Sport model) can easily be modified with changes in the resistance cell set, allowing for increasing and decreasing the resistance, depending on the user’s change in abilities. As with other muscles in your body, your respiratory system benefits from warming up and cooling down. PowerLung users are provided with a warm-up and warm-down routine to prepare the user for more rigorous work. Due to its light weight, the warm-up can be completed while warming up the rest of the body for the workout. Different muscles are engaged with both inspiration (breathing in) and expiration (breathing out). During inspiration, the diaphragm, external intercostals and some of the muscles in the neck are engaged. In expiration, the abdominals and internal intercostals are engaged. The addition of expiratory RMT provides an even greater workout by including the abdominals. One major convenience of the PowerLung device is its portability. Weighing less than a pound and small enough to fit in your hand, users can take this training device with them anywhere. As is true of most training programs, it takes 3 weeks of regular use to see significant benefit in breathing capabilities with regular use of the PowerLung. And after an illness or injury, users should reduce the levels or move to a less restrictive resistance cell until they return to their previous abilities. The question here is: who couldn’t benefit from better breathing? Elite athletes and musicians often come to mind when RMT is mentioned. However, even amateur athletes and those who desire to improve their fitness will find increased respiratory abilities with PowerLung use. For those suffering from respiratory conditions like Asthma, Parkinson’s, COPD, and even congestive heart failure find that increased pulmonary function and reduced breathlessness contribute to healthier living. PowerLung is dedicated to its customers, providing superior customer support throughout the purchasing process. Whether investigating possible uses of the PowerLung, deciding on the right model, or considering new resistance cells, PowerLung representatives provide expert help in answering frequent questions. PowerLung owners are given detailed information like instructions, a carrying case, cleaning supplies, online & telephone support for users at all stages of ownership.